Professional security advisors, law enforcement and emergency personnel were all consulted and played a part in the security design for this facility. Staff members have a trained eye for potential security breaches and other on-site activities. One of the most innovative and sophisticated security systems available to date has been implemented at McBride’s. 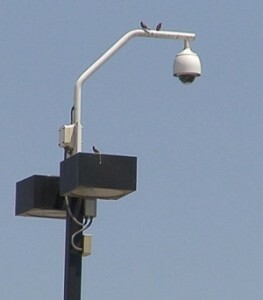 A combination of surveillance video cameras recording and tilt/pan/zoom cameras that zoom in, focus and follow movement throughout the yard have been built into the RV storage yard. Electronic coded access security gates integrated with modern computer software provides even more security. 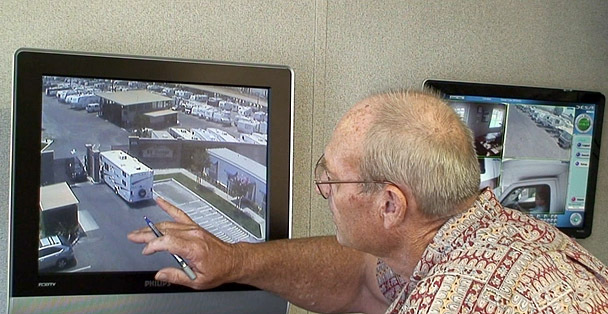 McBride’s state of the art video surveillance, personal security inspection and professional monitoring makes McBride’s a very secure RV storage site. Customers have peace of mind knowing that their vehicles are safe when they are at home away from the storage facility. Location plays an important role in the security of this facility. The facility is located in the new upscale part of town, far away from any crime related areas. Local Police have special access to patrol the facility at all hours of the day or night. Many law enforcement officers recognize the security features that McBride’s offer, that’s why most law enforcement officers have chosen us for their own vehicle storage needs. Security was number one on our choice for picking a storage facility. After careful consideration and evaluating all of the RV storage facilities in Southern California, it was clear to me that McBride’s was my best choice.? Taylor,? Inland Empire CA.